All Products > "57799 Tamiya XB BMW M3 GT2 TT-01"
The ready to run electric powered R/C Car of the 2009 BMW M3 GT2 was developed to compete in the American Le Mans Series. Rahal Letterman Racing raced the cars on behalf of BMW Motorsports. 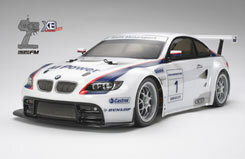 The return of BMW to the American Le Mans Series competitions coincided with the 10-year anniversary of the series in 2008.